It's well known many confidential informants are criminals. Acting as informants is supposed to keep their criminal acts to a minimum while providing access to bigger criminal fish. The same goes for undercover officers and agents. Some illegality is presumed but those running CIs are expected to be making the world a better place, not ignoring vast amounts of criminal activity simply because the informant is now on their side. But that doesn't seem to be the case. The DEA's informant program is being run with almost no oversight, according to an Inspector General's report. Money flowed to informants who were still under federal investigation and no one up top seemed too concerned about the program's bang/buck ratio. The FBI made abusable programs worse by hiding payments to informants and giving them a cut of forfeited property. It's not that informants can't break the law. In some cases, they must. But the illegal acts must be done with permission and as an integral part of an investigation. But that's not how things work out. Trevor Aaronson of The Intercept tells the story of FBI informant Mohammed Agbareia, who participated in terrorism stings while making a healthy, illegal profit on the side. According to court records, Agbareia began working for the FBI only after being convicted in U.S. District Court in Alabama for conspiracy to commit wire fraud. After pleading guilty to the wire fraud case in March 2006, Agbareia was ordered to report to immigration authorities for possible deportation. But instead of being removed from the United States, Agbareia signed up with the FBI. The threat of removal and/or the dangling of citizenship is a powerful motivator. This is why multiple federal law enforcement agencies have turned the nation's borders into unofficial recruitment posts. But old habits die hard. The Intercept reports Agbareia has again been indicted for the same criminal activity. According to a new wire fraud indictment handed down in Florida on June 27, Agbareia has continued to swindle people with his stranded traveler scheme. He received six Western Union wire transfers from 2012 to 2017 from victims in Texas, Colorado, New York, Ohio, and Germany. Two of the wire transfers — one for $1,414.26 from Berlin and another for $1,000 from Brooklyn — occurred around the time he was working undercover in the FBI’s ISIS sting. The government is trying to bury this damaging information. It has already asked for evidence of Agbareia's illegal sideline to be placed under a protective order, supposedly for national security reasons. The government is also refusing to turn over information of Agbareia's criminal efforts to one of the accused, despite two of three suspects targeted in the sting having already pled guilty. Federal prosecutors’ position has been that they do not have an obligation to provide information about the FBI’s informant so far in advance of a trial, since Hubbard’s is not scheduled until October 30. “In a national security case at this point, I mean, we understand our obligations to turn it over, but the trial is in late October,” federal prosecutor Edward Nucci said in the March 14 hearing. The remaining suspect's defense lawyer has been asking for this information since 2016, pointing out that the proactive nature of sting operations should result in proactive delivery of evidence by the government. Agbareia is now in the awkward position of having government demands for secrecy work both for him and against him. In the terrorism stings, the government is playing keep-away with anything that might damage his status as a source of evidence. In his wire fraud prosecution, the government is looking to bury info he might use in his defense. National security-related suppression is being asked for in this case as well. If the government succeeds in this evidence suppression, it might be able to run the prosecutorial table -- convicting a suspected terrorist and the crooked informant it used to rope him in. Earlier this year, Senator Dianne Feinstein, who seems to be an endless well of bad ideas around surveillance, started pushing a bill that would require internet companies to report to the government any content they suspected was posted by terrorists. This bill has all sorts of problems, not the least of which is that most of the major internet companies already alert the government to any terrorist-related content that they come across. But, by mandating such reporting, it will only lead to these companies filing a bunch more reports -- much of which will be bogus, flooding the government with useless information, just to avoid running afoul of the law. But, of course, in the wake of the Paris and San Bernardino attacks all bad ideas are back on the table, and Feinstein is bringing this one back as well. She's teaming up with the intelligence committee's other biggest cheerleader, Intelligence Committee boss Senator Richard Burr, to reintroduce the idea, and they put out a completely bogus statement that plays up the fearmongering angle as much as possible, about those darn ISIS people using social media. Neither of those quotes makes any sense. Again, most companies already report stuff, and mandating it will only lead to more bogus reports to avoid liability for the companies, while potentially leading to less active monitoring since they only have to report stuff if they come across it. As for Burr's assertion that this is necessary to give law enforcement "the tools" to find this information -- that's a totally different issue. Doesn't law enforcement have computers? Can't they go to Twitter and Facebook and YouTube themselves and do searches? Let’s make sure the record is clear: The Director of the FBI testified a few months ago that social media companies are ‘pretty good about telling us what they see.’ Social media companies must continue to do everything they can to quickly remove terrorist content and report it to law enforcement. I’m opposed to this proposal because I believe it will undermine that collaboration and lead to less reporting of terrorist activity, not more. It would create a perverse incentive for companies to avoid looking for terrorist content on their own networks, because if they saw something and failed to report it they would be breaking the law, but if they stuck their heads in the sand and avoided looking for terrorist content they would be absolved of responsibility. I’m for smart security policies. If law enforcement agencies decide that terrorist content is not being identified quickly enough, then the solution should be to give those agencies more resources and personnel so they know where to look for terrorist content online and who to watch, and can ensure terrorist activity is quickly reported and acted upon. It's a bad idea and Feinstein knows it's a bad idea, because all of this has been explained to her multiple times in the past. So why is she still proposing it? People like to debate whether or not Wikileaks is or is not a "media property," but I can't see any definition of a media property under which Wikileaks would not fall. Yes, it publishes leaked documents, but so do many other media properties. Yes, it has a strong ideological viewpoint, but so do many other media properties. So it's rather stunning to read about the fact that a Wikileaks insider apparently spent some time as a paid informant for the FBI, handing over a variety of internet information on things happening within Wikileaks. Imagine if this was the NY Times or the Wall Street Journal, and it came out that an employee was getting paid by the FBI to reveal what those newspapers were working on. People would be up in arms, just like they were over the DOJ's spying on AP reporters and a Fox News reporter. Except, this wasn't just spying on a reporter, this was flat out paying off an insider to share internal information. That's incredible. The entire story from Kevin Poulsen at Wired is worth reading, about how Icelandic teen Sigurdur Thordarson was taken under Julian Assange's wing and given a fair amount of autonomy within Wikileaks. The details suggest that Thordarson abused that position in many ways, including setting up a t-shirt sales site, supposedly to benefit Wikileaks, but where all the money went directly to his own bank account. But, that's really minor considering the key point: that the FBI actively worked with and continued to push Thordarson to get more info from Wikileaks, even after he'd left the organization. The DOJ is supposed to have rules about investigations of media properties for a variety of reasons, and paying off an insider seems like it goes way, way beyond what's appropriate. The latest Radiolab "shorts" episode, entitled Grumpy Old Terrorists, seems like a bit of a departure in subject matter for that program -- but fits right in with something we've been talking a lot about lately. Over the past few years, we've noticed the rather disturbing trend in how the FBI keeps publicly celebrating stories about stopping terrorist plots -- but in almost every case the details show that it was actually just stopping its own terrorist plots that it feeds to hapless individuals, often nudging them and pushing them down the road to "become" terrorists, despite commonly displaying little to no aptitude for actual terrorism. In the last few weeks, the mainstream press has started to notice this as well, with stories about it appearing in both the NY Times and Rolling Stone. 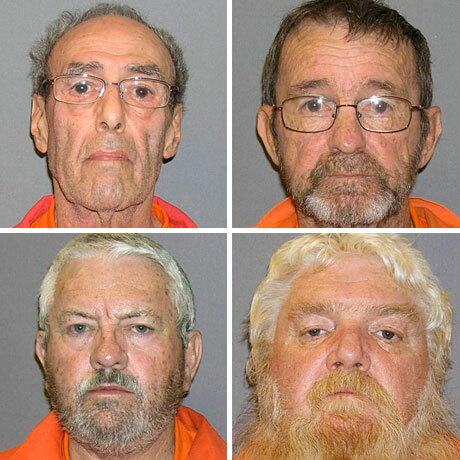 However, the Radiolab episode highlights a similar, but slightly different story, that was actually covered in great detail in an article in Esquire a few months back, entitled Waffle House Terrorists -- which includes the mugshots of the four "terrorists." The youngest one of that bunch is 65-years old. The oldest is 73. As the Radiolab episode and the Esquire piece detail, while these guys do seem hateful, they also seemed absolutely unable to do anything... until an "FBI informant" joined their pack and pushed and prodded them along, introducing them to the "contacts" to get weapons and even providing "the money" to buy said weapons. The Esquire article goes into great detail about the "informant" and his rather questionable legal history (he first contacted the FBI while in jail for molesting his wife's daughter from a previous marriage). On Radiolab, they play the audiotapes the guy made of the plotting -- and there's obviously some crazy stuff being said. But, as they look deeper into the role of the informant, the Radiolab hosts conclude the episode by noting that the whole situation doesn't really make them feel any safer. Yes, these old guys were hateful and helped join in this plan to cause lots of death and destruction. But, so much much of the plot and the participation of these guys really does seem driven by the "informant," who does not seem like the most credible of guys. And it's this exact scenario that we keep seeing over and over again. It may not reach the level of entrapment, and it may put some people really ignorant and crazy people in jail -- but is this really the best use of the FBI's time and efforts? Creating bogus "terrorist" plots involving people who had no real means to actually do anything? Over the last few years, we've noticed that nearly every victory the FBI celebrates against terrorism is actually about stopping its own terrorist plots that it feeds to hapless individuals, often nudging them and pushing them down the road to "become" terrorists, despite commonly displaying little to no aptitude for actual terrorism. Add the NY Times to the newspapers who are beginning to question the FBI's penchant for setting up its own plots for the sake of a high profile arrest of some clueless individuals. The United States has been narrowly saved from lethal terrorist plots in recent years - or so it has seemed. A would-be suicide bomber was intercepted on his way to the Capitol; a scheme to bomb synagogues and shoot Stinger missiles at military aircraft was developed by men in Newburgh, N.Y.; and a fanciful idea to fly explosive-laden model planes into the Pentagon and the Capitol was hatched in Massachusetts. "Only the government could have made a 'terrorist' out of Mr. Cromitie, whose buffoonery is positively Shakespearean in its scope...."
This is the same guy who laughed at earlier attempts by an FBI informant to get him to get involved in a plot. There's no doubt that there are real plots being attempted. But wouldn't the FBI be better off focusing on those, rather than play acting all the time? A few weeks back, we wrote about the FBI celebrating that they stopped a terrorist plot that appeared to have been mostly planned by the FBI itself -- basically encouraging one guy, who had no actual terrorist connections, to think he was a part of a terrorist plot where none actually existed... and then arresting the guy. As we noted at the time, we knew of at least two other very similar stories, where US law enforcement appeared to set up people in such a manner. Rich Kulawiec points us to a Washington Post story that's even more ridiculous, involving a guy hired as an FBI informant to spy on mosques in Southern California. As part of his "job," he also talked up terrorism and jihad in an attempt to "find" potential terrorists. Instead, the folks at the mosque were so freaked out by the guy that they took out a restraining order on him and (you guessed it) reported him to the FBI. I really would like to believe that the FBI and other aspects of federal law enforcement have a better grasp on actual plots against the US, but stories like this (which seem to come straight out of stories for bad Hollywood movies) suggest an FBI with way too much time on its hands, trying to manufacture plots so they can save us.